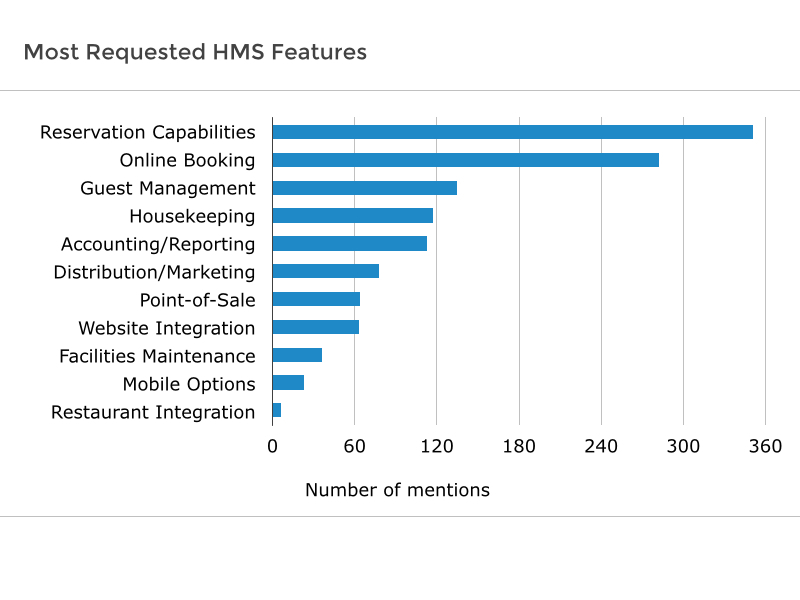 Hotel Management Software (HMS) BuyerView 2014, a survey conducted by HMS research firm Software Advice, who surveyed 385 randomly selected buyers in 2013. The survey was conducted in order to discover what exactly buyers expect or want when they are choosing software for their property. According to the report, 54% of hotel management software purchasers in the industry are independent small to mid-size hotels. The report also states that majority of the buyers are adapting to the latest software in order to leave behind the manual management of their property and buyers who are specifically looking for a software which offer reservation and online booking facilities. Majority of the owners or managers, who are looking for a software solution represent (57%) properties which have 10 to 50 rooms. A combined 11 percent of buyers are from very small properties such as B&B’s, Inns, chain hotels, or large hotels with 500 plus rooms. 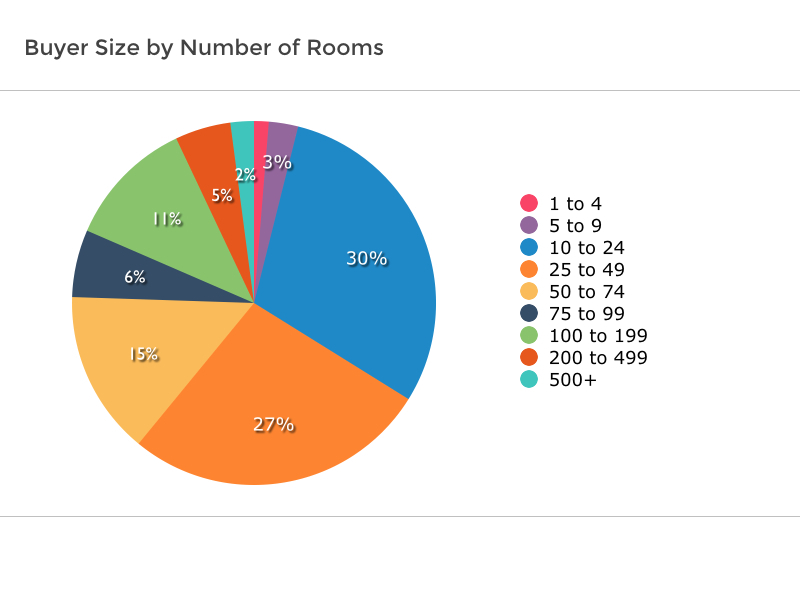 When consulted with various managers and owners of different property types, the report found that around 1 percent is looking for software for a large hotel or a chain hotel. This is not surprising as the big brands usually have to go for in-house or corporate-mandated software. 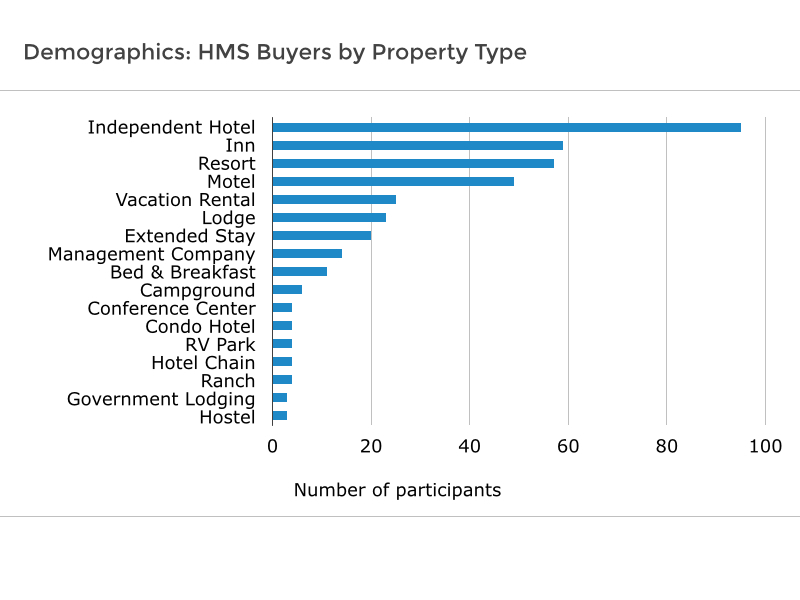 The rise of independent properties is very evident from the fact that majority of the buyers (54 percent combined) comprised of independent hotels, inns, and resorts. As the travelers are also opting more for independent hotels, inns and resorts, the properties have to adapt to new technology and advancements to keep up with the growing demand. 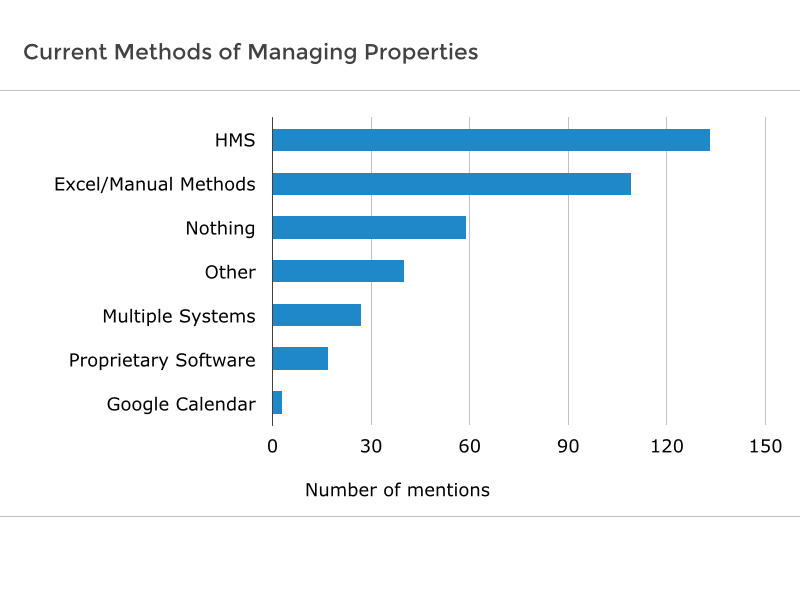 When questioned about what method they currently use to manage their properties, 34 percent respondents are already using a property management system. 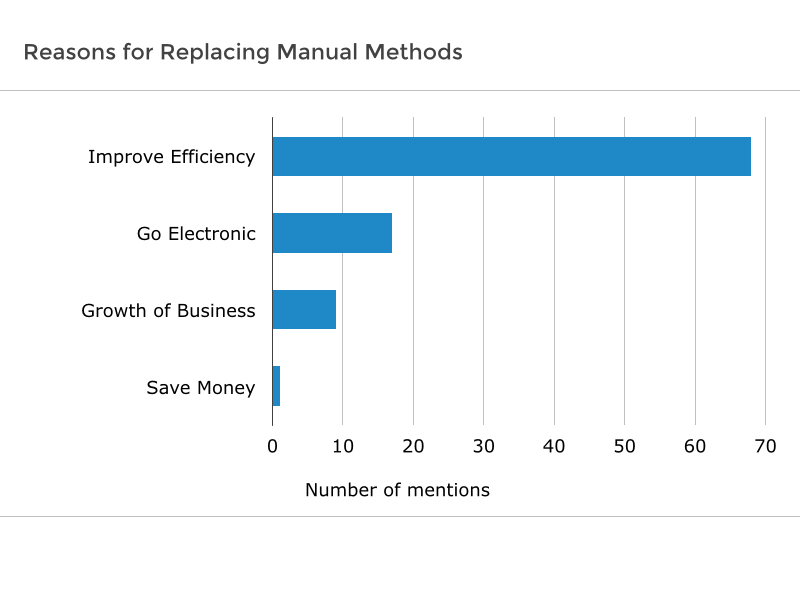 The next 28 percent use manual methods consisting of spreadsheets or paper, on other hand 15 percent had no method in place. The “Other” categories (10 percent) use independent booking system or have stopped using a property management system. 7 percent of buyers use management software with reservation facility to meet their requirement, and last 4 percent use software built specifically for them. The report also highlights the diverse set of reasons which buyers have provided. Approximately 18 percent are looking for speed and efficiency in software which is also compatible with the latest hardware in the market. 16 percent of respondents said they go for a new product because the current one being used lack the necessary features, such internet bookings and channel management, other 15 percent just wants to improve efficiency. The rise of Global Distribution System (GDS) channels over last few years is no surprise as online bookings have become a standard norm in the industry today and since 2011 bookings from GDS has grown by 14 percent. Making it a surprise to no one that one of the most frequently request feature is the feature to connect to the (GDS) and system with ability to manage real-time rates and inventory. 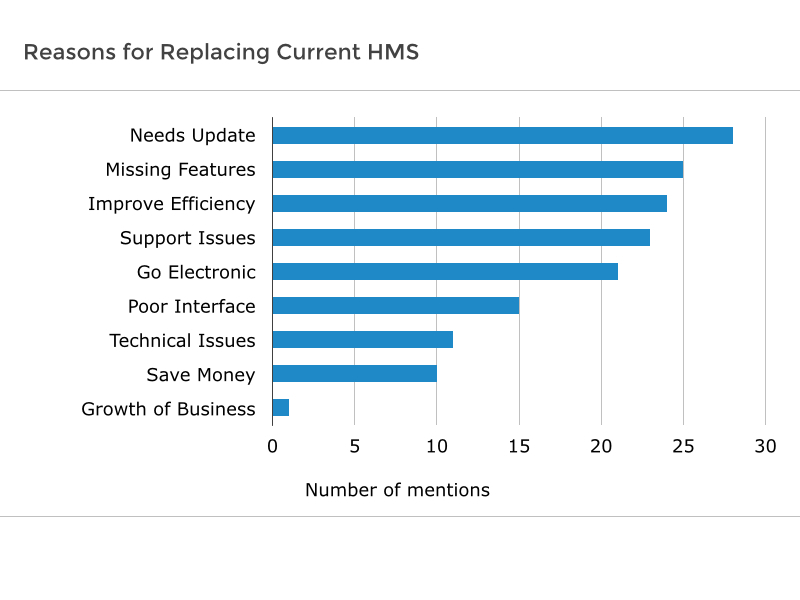 Among others looking for an upgrade towards new software is bad experience with support service (15 percent), lack of satisfaction with user interface or GUI for other 9 percent and unsound technical software for the 7 percent of the respondents and remaining 6 percent are looking for a solution which requires minimum investment. 72 percent of first-time buyers for hotel software make it clear that they want to achieve higher efficiency in their day-to-day operations and get away from the traditional methods. Property Management System can automate daily operations and bring a higher level of efficiency. 28 percent of total respondents, the highest in this survey said they would like the ability to enter and edit reservations, which is a central function of a property management system. The next 22 percent buyers want an online booking capability giving them a competitive advantage, which does not surprise as 65% of hotel bookings now are made online. Approximately 11 percent would use guest management feature which will help them maintain information about their guests in order to understand them better and provide better service in the future. Housekeeping management was important for 9 percent of respondents and another 9 percent expect advanced accounting and reporting feature. Lastly 6 percent of hoteliers want a distribution management and marketing functions part of their hotel management software. 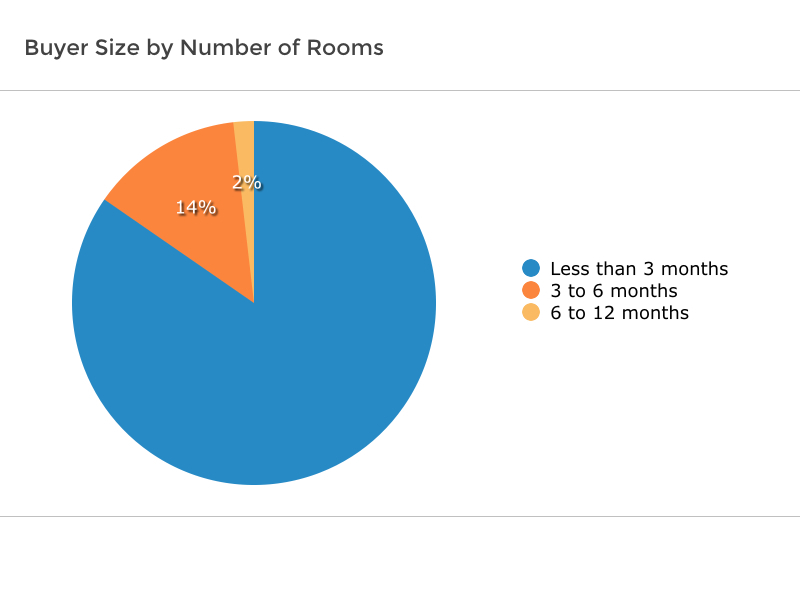 Staggering 85 of buyers expect the new hotel software to be implemented in less than 3 months; given the nature of the industry and how fast things are evolving it comes as no surprise. 14 percent want system to be implemented in three to six months, and remaining 2 percent in 6 to 12 months ahead of time. Analysis by Software Advice Team, reflected in the report clearly shows the diversity and rapid expansion of independent hotels and how they are demanding higher-performing systems with latest features. As the competition is heating up across the industry, first-time buyers or buyers who are upgrading are looking for a solid property management system with specific features, real-time reservation, online bookings, channel management and guest management as it is the key to constantly grow and stay ahead of the competition.